← Contest Deadline Extended Until Tuesday, November 15th @ NOON! This week’s basket from Milk and Honey Organics included Braeburn Apples, Kiwifruit, Ruby Grapefruit, Yellow Sweet Jumbo Onions, D’Anjou Pears, Celery, Romaine Lettuce, Klamath Pearl Potatoes, Chiogga Beets, Hass Avocados, Limes, Roma (Plum) Tomatoes, and Hurricane Creek Cucumbers. And here’s a meal plan that uses the majority of the recipes above, along with some others. Mix and Match the possibilities and figure out what works best for your family! Click on the meal plan below for the PDF with links to recipes. Bon Appetit! And Enjoy the Journey! Happy Weekending! By the way, I’m taking a blogger break this weekend, so I’ll see you back on Monday! Don’t forget to enter the contest for the Joy Bauer Food Cures book by Tuesday at noon EST. It really is a fabulous resource!! This entry was posted in Organic, Recipes, Time Management/Organization and tagged apples, avocados, beets, celery, cucumbers, grapefruit, kiwi, limes, meal plan, milkandhoneyorganics, onions, pears, potatoes, romaine, Tomatoes. Bookmark the permalink. 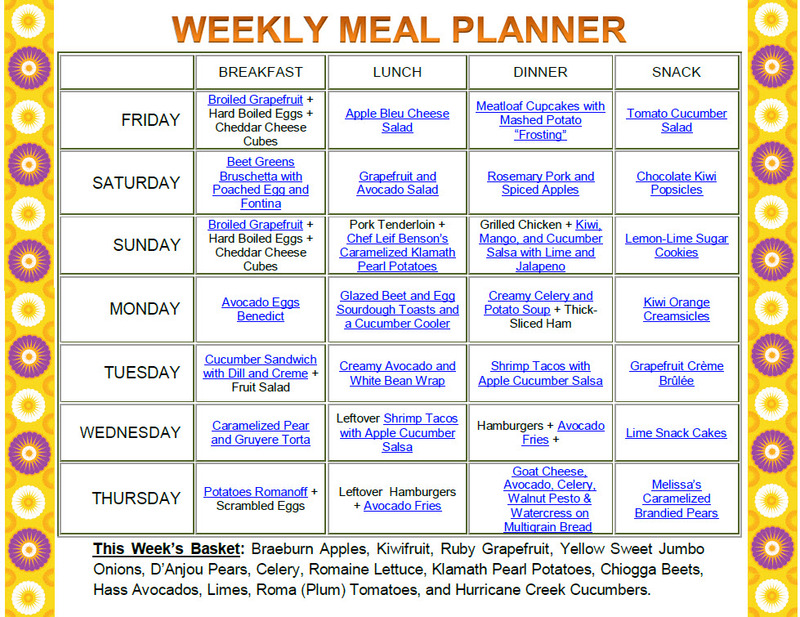 that meal plan looks so good! love all the fresh produce!